Our 90th year ended yesterday, and I would like to thank you for being part of our community. Through your support as a member, donor, or visitor, we are able to bring art and ideas to life, and share them with people in Honolulu and around the world. Over the past 12 months, we explored the art of Shahzia Sikander, Karen Hampton, Maki Haku, Noorjehan Bilgrami, Christopher Cole, and Roberta Griffith; presented the unprecedented exhibition Abstract Expressionism: Looking East from the Far West; mounted a new kind of Artists of Hawai‘i; helped Emily Spivack with her pop-up installation Medium White Tee (the writer and artist now has a project at MoMA and a new book out) restructured our curatorial and education departments; refreshed our Central Courtyard and its surrounding colonnades thanks to a gift from the Shidler Family; held free art-making workshops at Spalding House for the public; put on the Celebrate Micronesia Festival; participated in the first Honolulu Biennial; won #ArtMadness; held a Soundshop music education program on Molokai; created the new school tour Literacy Through Art; and screened a 27-film retrospective of Akira Kurosawa’s career. Those are just a few of our 2017 highlights and we could not have done it without the support and participation of the community we serve. 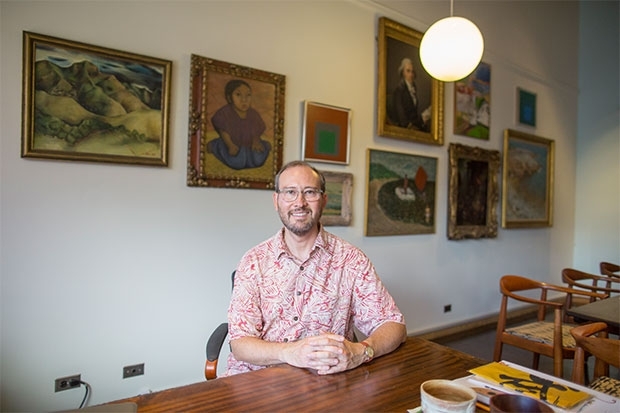 You make the Honolulu Museum of Art—at all its locations—an inspiring place for all, and we are grateful for that. Looking forward, the new year will be a significant one for museum programming. In a strategic move to better serve you, we have combined our curatorial and educational staff into one division, and the museum’s upcoming offerings reflect this shift. Now all programs are linked to museum exhibitions and collections. For example, if you take an oil painting course at the Art School, there will be related artwork on view at the museum that will help increase understanding and appreciation of the topic being learned. There could also be a lecture by a relevant expert, be it an art historian or an artist. This type of integrated learning is what visiting a museum is all about, and we want to ensure that you can maximize your HoMA experience by giving you access to the all the art resources we can offer! Coming up in 2018 is a series of exciting exhibitions. First, you still have time to see our pioneering show Abstract Expressionism: Looking East from the Far West—it is on view through Jan. 21. After the midcentury immersion, we bring you bring you back to the 21st century with Abstruction: The Sculpture of Erick Swenson, the first solo museum show of this Texas-based artist, opening March 1. Then we end the year with the major exhibition Ho‘oulu Hawai‘i: The King Kalākaua Era, another show that, like Abstract Expressionism, puts Hawai‘i in a wider dialog and context. And of course the curators will also be busy presenting numerous regular art rotations in our permanent galleries. This year also brings a significant Hawai‘i milestone—the 150th anniversary of immigration from Japan to the islands. Fittingly, our Abstract Expressionism show features nisei Japanese-American artists who made significant contributions to our understanding and appreciation of art in the 20th century, with masters such as Isami Doi, Bumpei Akaji and Satoru Abe. Harry Tsuchidana, another one of the Japanese-American artists from Hawai‘i featured in the show, once told me that the most eye-opening job he had ever had was being a night watchman at the Museum of Modern Art in New York City. The position gave him quiet, unfettered visual access to works by the great modern masters, such as Picasso and Pollock. Keep your eye out for influences going both ways when viewing the works of these Hawai‘i artists and those from the mainland, such as Pollock, Rothko and Kline. Abstract Expressionism is truly remarkable and if you have not seen it yet (or even if you have), it is well worth the trip. Profound offerings such as this are rare in Hawai‘i (although we are working to make these occur more often), and it will be an experience that you will tell your friends and relatives about for years to come. On that note, I hope you enjoyed your end-of-year celebrations and I look forward to seeing you at one or all of these exhibitions in the near future.